Glenbrook is a small, quiet, pretty community with resort facilities, situated in Cagan’s Crossing on the US27 just north of the US192 and is around a 20 minute drive from Disney - in fact, it's so close you can even see the fireworks at Magic Kingdom in the distance from certain areas in the community. This prestigious community, with attractive palm-tree, lined roads, has just 266 luxurious homes ranging from 3 to 7 bedrooms – many with 2 or more ensuite bathrooms. 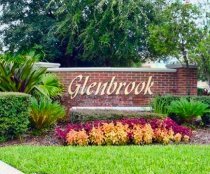 Within walking distance of Glenbrook is a Sweetbay grocery supermarket, CVS and Walgreens, whilst other supermarkets such as Walmart, Target, Publix are just minutes by car. There are numerous restaurants nearby including Chillis, Santa Fe Steakhouse, Olive Garden, TGI Friday, Longhorn Steakhouse, Orlando Miller Ale House, Bahama Breeze, Sweet Tomatoes, Manny's Chop House and Applebees. Glenbrook guests have access to its complimentary resort facilities including a community swimming pool, manned Club House with a 24hr gym, a games room, children’s play area, tennis & beach volleyball courts. Inside the clubhouse, there is also a media room with a large TV entertainment system, PCs offering free internet access as well as a wireless ‘hot spot’ for those bringing laptops. Each month there is a programme of events at the Club House. A Shuttle Bus can be organised from the Clubhouse, for a small fee, to all the major attractions and shopping outlets in Orlando. If you fancy a game of golf, then Glenbrook Resort is just minutes from Highlands Reserve, Orange Lake and Orange County National, once the home of the PGA qualifying school. Other nearby courses include Reunion Resort, Champions Gate and the Country Club at Champions Gate. We currently do not have any active listings for this resort but are always on the lookout for quality homes. If you own a quality vacation home, please contact us for details on how to list your home for FREE on our website.